BECAUSE THEY ARE ALL INAPPROPRIATE FOR YOU. Whew. I feel so much better now. I have been holding that in for a while. I took my daughter to this store because it is cheap and while most of the clothes are of questionable taste, there are gems to be found. Like the cute $10 button down shirt I got for my daughter. To add to the classiness of the store, the dressing room itself is like a giant girls locker room, without the lockers. No partitions, no privacy. 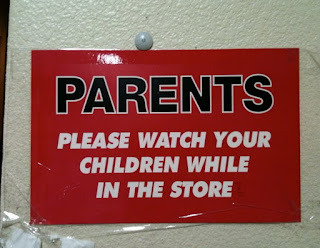 Another reason the store selection should be restricted to the very young. I don't care to see anyone's business trying to squeeze into a dress 2 sizes too small. Not a pretty picture. Yes, I live in Las Vegas so cleavage and booties are pretty much in season all year round but that does not mean I have to look at it. Me: Look at these Daisy Duke shorts. Why don't they just call them underwear and get it over with. Daughter who gets it: Because if they call them shorts they don't seem so sluty. I was teasing her about the country music she had us listening to in the car. Daughter who gets it: Country music has good values. They sing about God and family. You should be glad I am listening to it. Me: You mean like Cowboy Casanovas? Daughter who gets it: Would you rather me marry a Cowboy Casananova or a pimp? Hmmmm. Good point. Glad I am raising one of the good ones. *shudder* Not a dressing room I'd care to enter! I'm only 26! I don't want to have a heart attack just yet! But I laughed so hard at the shorts comment. That is so great that she gets it!! A lot of young women would wear the revealing clothes because it was the "style." As for the dressing rooms...ummmm.... no. I don't want to see anybody's business and I don't want anybody seeing mine! I love country music too, and for the most part the songs are good and promote good values. Some of them had to be inspired. Some of them talk about drinking and stuff. So it is great that she gets it. A good head on her shoulders. You have done well! Coming from someone who doesn't have girls, I can only imagine shopping being fun when they are little. With boys, it was never fun, they hated the mall. Although there is something to be said about Country music, I kinda like it myself!! Glad you have a girl that gets it!! I love that she gets it! She sounds amazing! That's one smart girl you got there! She is a good one for sure. Sounds like you have one great daughter there. This was a cute post. I couldn’t help but noticed that on your bio you said you love pride and prejudice (Colin Firth. That made me smile because that is my all time favorite movie since I was seventeen. I watch it every year! You have great taste! I loved this post and it definitely made THIS mom smile! (Not to mention we both have teens and I'm so glad to find a new friend!) We really have to meet one day - I love shopping in Vegas! Love your daughter's quick answers. Your daughter sounds awesome... oh, to be so quick witted! Seriously though. I love to hear of teenage girls who "get" it. It really does give me hope that it's possible. Or how about "Hillbilly Bone" song...So where is that bone located exactly? Oh online shopping, how I love thee! My daughter always gets a (whispered) lecture the entire time we go clothes shopping about all he inappropriate things we pass. I'm hoping she gets it, too. So far, so good!